5.0 out of 5 starsNice Camera! Although far better than my previous camera, I find that perhaps I should have bought a superior one to this model as I mostly take photos of skies and, from my home location, this camera doesn't always fare too well. Nor with fireworks. Nor, either, with late evening darkness. It might be user-ignorance on my part, as I haven't had occasion to fully road-test all the functions, so for the cost of this device it's certainly worth giving a try if you're a more informed camera-person than myself. This seems like a very good camera at a competitive price. I bought it to replace a previous Fuji which I had got very wet. This newer model has many improvements including a greater zoom range, removal of the function dial which was always getting out of position (now provided in software), larger screen and a built in battery charger. Slightly larger casing, but still easily slips into a pocket. It does everything I need. 5.0 out of 5 starsAN AFFORDABLE QUALITY CAMERA!! 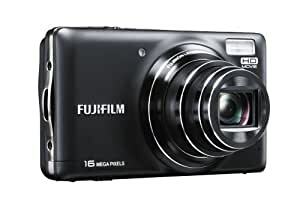 This camera is perfect for your everyday needs, simple yet effective with 10x optical zoom. Pictures come out perfect! You can spend extra money on camera's that are a little over £100 like Sony, but to be honest this is just AS good as those. Works great in the dark, went to a festival and pictures came out perfect at night. The menu and settings are great, an array of different shooting modes are available if you want them. It is very light weight and slimline so fits perfect in my handbag. You won't find a better camera that is as value for money as this! Honestly I have had Nikon and Sony digital camera's in the past and this is on the same level as those. This is a good little camera, the zoom is fabulous i brought it to take on a trip to Rome, it was great could stand at the top of building take a photo and then zoom very close with it still being clear. on getting home and putting the photos onto the computer/printing out etc I was pleased with the results. Probably not the best camera out there if you spent hundreds on the things, but for someone that isn't particularly a technology lover this camera is simple to use, gives you lovely photos and is reasonably priced. Also I got this in the blue color, which is also beautiful. This camera was a replacement to a more sophisticated, expensive camera that was stolen. It does everything that I want without additional functions that I never used. My only criticism is that it needs recharging quite often so I have purchased two extra batteries to carry as back-up in case of heavy use without the opportunity to recharge. Brought as a present for my purple loving daughter. The camera arrived on time (within 3 days from ordering) and she loves it. Good battery life, excellent photo's, simple to operate with lots of neat features that she is still learning to use.